Welcome to the Gingersnap Blog! I'm really pleased to be getting this started and have so much to share. As I shift my focus in my business I've decided to create more of a presence outside of the salon. Things you'll find here: tutorials for easy-to-repeat techniques in hair and beauty. Information about how to use and curate product at home. Behind the scenes insights into haircolor, styling, and extensions. Inspiration, both seasonal and as the wind blows. At heart, I'm an educator on one side and an artist on the other. Finding a new path within the beauty industry that really plays to my love of detail, craft and education has me so excited! One thing I would really like to see happen within the blog is collaboration. I love to find a hot topic amongst my clients for the week and consolidate that into useful info for people. Now that I'm directing my focus beyond the salon and my daily work behind the chair, I want to hear from YOU. What do you want to know? Is there a problem or frustration you're experiencing with your hair? Something you're curious about? Tell me here. I would love to workshop through your issue. Today I wanted to share something I'm really proud of. I've been giving my clients hair extensions for years- from glued-in wefts (yes, YIKES! Early days!) to halos, tape-ins, clip-ins and custom-cut wigs. 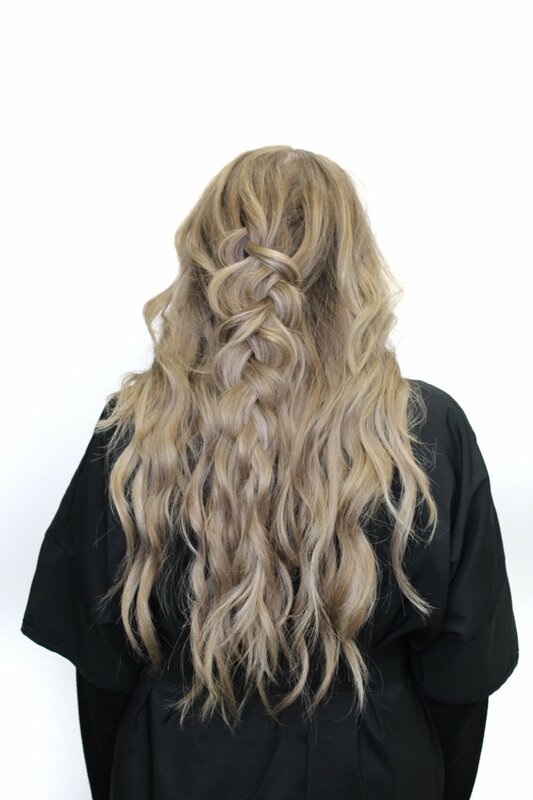 I started working seriously with long-wear extensions about four years ago with tape-ins, which work great for what they are (you can create dramatic change, add color, and they are wearable for about six weeks with minimal damage) and I was able to really create wonderful change for my clients. I started learning that customizing color for this hair took the service from "meh" to actually very lovely and convincing. I've had many clients commit fully to adding length and fullness using extensions, and I even wore a halo AND a fall for my own wedding! Julie is a long-time client of mine. We've given her a wide range of colors and styles with color and extensions- from platinum-vanilla blonde to natural balayaged blend, and then finally to beautiful copper blondes. She has loved wearing extensions for length and mermaid-y fullness as her natural hair can grow quite long, but hangs pretty flat and thins out around the ends. I had the opportunity to remove her tape-in extensions and give her the Natural Beaded Rows experience. The overall effect went from "hmm, pretty" to "OMG, your hair is INCREDIBLE" and actually left me stunned when we both looked at her hair with her custom-colored NBR in. Julie's new extensions don't use heat, glue or excessive points of contact, so the impact on her own hair is minimal to nonexistent. She can use any products she would like to- no limitations on conditioner or oils. Even better, the NBR hair has a gorgeous body wave so her hair will look stunning even when simply air-dried. No evidence! Perfectly blended, no lumps, bumps or bits sticking out. Her hair moves and flows like her natural would. NBR @ Gingersnap Hair is being offered by consultation. Please click through and fill out an application over here with your information and I will be in touch within 24-48 hours to set up a time to discuss your hair goals! I'll be setting up appointments for new clients beginning in late July and early August. Beauty comes from within- but sometimes you need a little boost on the outside to get that glow on. Looking forward to hearing from you all!